I love old Craftsman homes like this. What surprised me most about this one is how the homeowners updated it. As you’ll see when you peek inside, all of the original dark wood has been painted over. Even the hardwood floors are so light that they’re practically white. They’ve given an old house a new look. But does it work? Take a look around and let me know what you think! My favorite part of the house: the dark gray siding with the bright yellow entry doors. Gorgeous. Do you like the contemporary spin they put on the house and all of the white wood and pale floors, or would you prefer a more traditional style? I’m sure there are a lot of hardwood purists out there who are cringing that it was all painted over! If You Love Craftsman Houses, Click Here to See More! 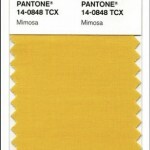 The Color of 2009: Pantone Chooses "Mimosa"
It is pretty white, but I like it! A little too white for me…I’m a country girl and just can’t get used to contemporary look. It has ABSOLUTELY NONE OF THE WARMTH I expect from a lovely Craftsman Home. I do NOT like it at all. The decorating is also quite “off”. Some Vintage furniture…and then stuff from the 50’s, 60’s. Quite a scramble. Although I believe in decorating for your own personal taste, someone’s going to curse these current owners someday when the woodwork has to be stripped and refinished to bring the house back to its original charm. I don’t care for the excruciating whiteness; warm it up a bit. Also, I’ve never seen a craftsman bungalow with a long, narrow hallway. Is there an addition on the back that we can’t see in the pictures? I am not crazy about this. It is nice, but it seems the personality of the house is no longer there. Reminds me of an apt. Not for me. I agree with Teresa, would not want to strip off the paint and restore it. A bit too stark inside and I couldn’t get over the strange combination of decor. I think the whites would be lovely if the furniture/accessories were warm colors. However, love the colors on the outside. It really appealed to me, but I’m not a purist. I love the unexpected and have always wanted to achieve the white look. Oh, Julia, it is right. Oh so right. There is so much to drool over. That banquette, my heart aches for it like a long lost lover. I’m all for historical preservation, but it is just a little bungalow. Why not a modern spin on craftsman? It is fresh, hip, and different. I wouldn’t give it a second look if it was all brown and maroon and mission furniture and YAWN. And, the exterior is perfect–I’m actually wearing grey and yellow today! Because, you know, I like to match the blogs I’m reading–ha! Oh, and the office looks like that of a designer–I knew someone knew what was going on! I love it,who wants a dated,dark dwelling,they did an amazing job. [Swoon!!] I LOVE this house. I really want that home office. How cool is that? I wish I could throw out all my stuff and make my home more modern like this. It looks great in that little home. To me, this looks like someone decorated who a) likes decorating A LOT, b) doesn’t understand architectural integrity, and c) decorates right out of the design magazines. Now, I have to say that white per se doesn’t bother me that much. I also don’t mind it in a bungalow, but the stark black and white modern does NOT work well in a craftsman. In fact, sleek modern does not work in a craftsman, in my view, regardless of color. On the other hand, I rather like the bath(s?) and the master bed. Those work well. I absolutely adore bungalows…..I think this house is phenomenal! But that is what is so great about a bungalow you can go either way with it. I think they did a wonderful job with this house and I love that it does have an eclectic mix about it. Thanks for sharing. You always give us so much eye candy. I must admit that when I first noticed the floors, I did cringe, I am one of those that loves dark hardwood floors, however, it really seems to work with this house. Even better, they made it their own. Brava! Interesting that the comments swing so strongly from one side to another. I love the house. I hate the floors. Although I tend to cringe at painting over historical woodwork, I could live with all the trim being white if there was some color on the walls. In fact, I would probably prefer it to all dark woodwork. Not a big fan of the mid-century modern vibe. I TOTALLY agree with Angela of The Painted House! I just love the way they’ve made it their own. I don’t think the house has lost its integrity at all – it’s still got all of its beautiful moldings and character. It’s just been updated a bit and someone put their own unique spin on it. Personally, I would have left the floors darker for a nice contrast with the white walls, but – to each his own! 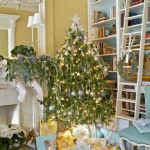 Your house should be decorated the way YOU love it and live in it – not to please someone else’s tastes. It’s very tastefully done. But I still feel like the whole house has been dipped in bleach. The true character of the craftsman style has been watered down to make way for their more upbeat living style. I’m a purist, give me the dark wood. All in all still a good looking house. I don’t understand why people who have such contemporary (or possibly retro chic?) decorating inclinations would WANT a craftsman. It seems wrong. If it were a brick ranch I wouldn’t bat an eye. I get the feeling from looking at it that the people didn’t really WANT a craftsman home but got stuck with it and have tried (and failed) to make it work for them. Sort of like those Ralph Lauren designed Airstream trailers. If you want to live in a cabin, Ralph, then why wreck a perfectly good Airstream with wood paneling? I feel like I just heard a chorus of nails on a chalkboard. Ugh. My first reaction is that I don’t really care for it. I think it is too white for my taste. I was equally surprised at how many have liked it so far. I like modern homes, architecture and furniture, but it’s just not working for me in this space. I think it’s kind of a shame. Yes, I agree… a home should be decorated to the taste of the people who live there. This is a very personal space and design and I’m sure the owner’s love it. I don’t necessarily mind painted white wood, but I think it looks best when it’s contrasted with some color. The hallway is a GREAT example – I love the way that’s done. The front rooms just seem a little too sterile for me. It’s obviously professionaly put together, and there are a lot of other great touches. Maybe if they’re showing it to TV producers, they want to show that it’s a blank slate! I actually love it, though I expected not to. I am a bungalomaniac and have kept the dark woodwork in my own house, but I love what this owner has done with his/hers. Starting from the crisp exterior – what a lot of curb appeal! That hallway, with the light fixtures, is so wonderful. The bathrooms are warm and cool at the same time. Yep, I LOVE it! I think it works. I prefer white painted woodwork to dark, stained wood, even in a traditional Craftsman. Now, the trendy, contemporary decor might be a bit jarring for this type of home, but I think the homeowners have injected it in very thoughtful ways that make great statements. I love the yellow and white hall, and the painted green, door inserts in the “green” room. i am one of those who is cringing at the painting of Craftsman woodwork. it is a travesty, and i agree with the above poster who wondered if perhaps a different style house would fit the owners better. Being Swedish myself, I think it looks really normal. 🙂 However, I wouldn’t break up the white with yellow and red or any warm colour (part for maybe a chocolate one), I would go for grey in different tones. I don’t understand all the need for EVERTHING to be white these days. We moved into a 60’s ranch several years ago and the young couple had started to paint all the woodwork white. It may look alright in the beginning, but it starts to look tacky when it begins to chip off. I agree with Liz. If the couple wanted this look why did they buy a Craftsman bungalow? The character and charm have been ravaged and a caricature of a house left behind. I’m sure it was easier to paint over everything than to do the hard work of recapturing the lustre and beauty of it’s original finish. Maybe the outside is okay, but still not typically Craftsman. If they wanted white, they could have done the kitchen and office and left the rest. I feel sad for the house and the people who are living in it. It’s obvious I’m a purist. It’s beautiful but I need color! All that white would make me crazy. I LOVE Craftsman houses, and seeing them all ‘modernized’ sometimes makes me a little sad. I much more prefer a LITTLE vintage character in these houses. I would like to see a greater contrast in most of the floors. My opinion is that the house is not ruined because they choose to paint the woodwork. They are the owners! I LOVE this – it preserves the architecture but ‘modernizes’ it. If a future owner wanted it more original looking, it’s relatively easy to strip the paint. There is more than 1 way to honor these homes, i think this is one of them. Just beautiful!! Oh yes I am cringing! Although there are some interesting and good design ideas, I think it was a shame to paint over all that wood. The floors look to be new possibly? Or they went to great trouble to refinish them so light. My experience with these homes the floors don’t come up that light. I grew up in an old gorgeous craftsman and I know what that wood looks like underneath all the paint. I guess I am a purist? I do still think it is a nice home. It is pretty, but wouldn’t work for me. I love the traditional craftsman style. I. Can. Not. Believe. They. Painted. All. The. WOOD. Trim. I think I can hear The Greene Brothers crying in Heaven right now…..
I’d prefer darker floors but beautiful home. The painted trim is nice. A little stark, would of used a warmer color on the trim inside and out. The craftsmen’s around here, my neighborhood built out in 1936, have two types of woodwork, either Gum (eucalyptus) or fir. The fir was cheap and meant to be painted. In Chicago and Detroit the choices were usually White Oak and Southern Yellow Pine, again the pine was intended to be painted. Or the house could have had the trim painted out before 1975 and then it is just cheaper, easier and less harm to the environment to encapsulate the lead based paint then go through the abetment process. So if they covered up Oak, then I have friend with a basement, lets call it a workshop. I agree with Dee. To me, it would look better with dark stained floors and although I like it, I do feel bad for the future owners who might want to strip all the wood. too white for me. i guess if were a different style house, i wouldn’t mind so much, but since craftsman is my absolute favorite, this one hurts my eyes just a little bit. JUST RIGHT! I love the modern take on a classic style! Fun pics! I love it! That office is to die for. I’m a rug gal myself, so the downstairs is kind of screaming for something on the floors. Just a personal preference though. Still beautifully done. The light floors go very well with the mid-century modern decoraing they’ve chosen. However, I don’t think that mid-century modern mixes well at all with craftsman. Doesn’t work for me; the warm charm of the era is lost. I do, however, like the layout of the kitchen, seems pretty large for the size of a bungalow. It’s a fun update but we’d need to see some color on those walls! I have a Craftsman and, quite unexpectedly, I have to say I LOVE IT! I enjoy how they have reinterpreted the home to create electric and the craftsman woodwork becomes tone-on-tone character. I’m going to seriously rethink my own home’s personality and decor. And personally, I don’t believe in having a home and living in it with a mind to its value to future owners. To me that is the difference between a house, and a home. love it! I hate when people refuse to paint over wood – why not paint it? furniture is painted all the time. the house is beautiful – I especially love the long hall with the wallpaper! I like the white but would like it much better if the trim, posts/columns were painted in a slightly darker or contrasting color. I like a more traditional look myself. There is not enough color or warmth there. I feel like they almost were working against the house instead of with it?? KWIM?? Definitely not homey. I could live with the kitchen, however. And maybe the yellow door. What they did is mostly fine, if not pretty good, but it’s not right for this house. I can forgive painting woodwork, too. It’s the style that’s off. And this goes beyond traditionalism. I with I was properly schooled in articulating how it’s wrong. It has to do with the scale and ratios, I think. It’s like putting low, sleek Scandinavian design in a high ceiling Victorian. I love them both but not together. It’s just wrong. I ADORE the outside of the house. The inside is very nice but it doesn’t match the style of the home. I do LOVE the garage office… I am converting mine to a game room and I am going to use that curtain idea to hide the garage door… it must helpwith warmth too besides looking nice… GREAT post as usual! Very helpful to moi too! The first two interior pictures are really great but then the design work begins to get a little off track and fall apart. I’m not a true purist so the idea, in and of itself doesn’t bother me at all (updated, modern, vintage, mod, funcky, eclectic,craftsman) and let’s face it, these houses are a dime a dozen. My neighborhood is simply drowning in them, so if Frank Lloyd Wright didn’t sleep here then why feel as if you must make a purists museum out of the house you LIVE in everyday? The floors are completly AWFUL though. They would have looked much better and grounded the design if they had been done in a dark putty color similar in depth and tone as the floors that are visible in the shots of the bathroom. Don’t even get me started on the wall to wall in the bedroom. LOVE this house!!!!!! Very cool!!! Brrr…I feel cold. I do not dislike all white interiors (when done well), but this one, with the exception of the hallway and garage/workspace, look a bit anemic. I have been so busy with work and kid’s stuff this week that I am just now getting caught up on your posts. I’ve missed some really good ones! I can always count on you for keeping me in the know on all the good stuff!! It is “magazine worthy”, but not appealing to me personally. I would be throwing splashs of color all over the place to warm it up. The furniture and decor is very nice. but the white walls are boring. I think if some rooms were painted another color the great stuff would pop more. Very nice house though. A little too white and everything seems to be shoved up against walls. The space doesn’t flow right. Craftsman from the outside but not the inside. With all that said, I like the kitchen. I am very sad for all of the wood that was painted. I could understand a room or two, but the whole house. The mix of the modern in the craftsman does not work for me. Sorry, I am a purist. Way too drab for me. And they should be shot for painting over the wood trim. As someone who is in the process of stripping all of the painted trim in her bungalow (and wondering what in the world the POs were thinking by painting it), I cringed when I saw these pics. I’m of the opinion that bungalows should be warm and cozy, like the original Craftsman mindset intended. To me, that means natural or stained floors and trim and warm colors–none of which are found here. This house is AWESOME! I’m going to stare at it for hours and hours. I love the Kitchen and hallway. Great ideas! Please keep them coming. have you seen this? Britains smallest house. When I think craftsman i think warm earthy wood tones. While I appreciate the light and space they’ve brought to this home, it doesn’t work as a craftsman to me. More of a “too lazy to refinish so I’ll use paint” theme. Hi! I just blogrolled over here. 🙂 I like the house. Craftsman is about lines and texture, not paint vs stain. At least not to me. My craftsman is covered in white, but I think in retaining the floors I retained the warmth. You’re welcome to come look! I didn’t see this post last month but just had to comment. I’m a big fan of Craftsman homes in their original state. However, I am totally amazed at the transformation in this one! I love it. Scandinavian and very modern and fresh. It took a lot of forsight and planning to get this look and I am impressed. What a surprise to see the exterior and then peek inside! It just goes to show you that you can take any house and make it special. Great job! Wow – not what I would have done. I like the outside. Laminate floors and white painted woodwork do not fit that house. BUT, its their house and they can do what they want with it. It will kill resale. The inside looks to Country to me, also some of the other elements do not match with the Bungalow style. I would not like it as it is. This place looks like a barracks or someplace to get an illegal abortion. Eo they issue straight jackets for their dinner parties? It’s a Craftsman Bungalow, frcryinoutloud. I like the bathroom. It at least has some personality. If they wanted an Eichler, they should have bought an Eichler. I agree with Handguy. They’ve ruined the essence of this house and its resale value. There’s this story that Mrs. Gamble was trying to sell the G&G house in Pasadena and when she heard a potential buyer remark that they would paint over the teak paneling within a month of occupying it, she took it off the market for 35 years. Too bad she wasn’t around for this. This is nice. Makes my Craftsman look ugly. I love this house and the look that was created with the white and light colors. I may not keep all the white in the kitchen, but overall the place looks great. I grew up in a town filled with bungalows. All, without exception, had been painted over at some point, most of them during the fifties. If you look through the decor of this house, which admittedly is odd, the light colors really brighten up the home. If you take into account most bungalows have 100 year old trees shading them, small windows, etc. with the natural wood inside, they get very very dark, especially as the wood ages. Now that some of these homes are in the hands of second and third owners that crave “craftsman” style, they are finding that living in a dark house is depressing. the white is too much. a finer way to go would have been to soften and warm up the white tone and keep some of the natural wood in trim, doors and floors. the contemporary furniture does not really work in what has become an overwhite lake cottage and there is too much of it in the living room. craftsman homes can be too dark and somber for modern times but need to be treasured for the beauty of fine workmanship that so many of them exemplify. the exterior is very handsome but sadly the interior does not hold up what the outside promises. This is craftsman. The best part of this style of home is the NATURAL wood work. Paint it??? It’s clear you’ve never spent HOURS and HOURS striping paint off the windows, doors and other trim work to “TRY” to get the home back to orginal condition. ANYONE can slap on paint, not everyone can keep wood looking it’s finest. I do like the color scheme and all but on Suburbia type home not classic construction. white is beautiful and neat, but i also like the last photo..plain and simple.thanks for sharing. I love the bones of the house. I can see the historical craftsman underneath. If they had left the paneling dark I think it would have created a nicer contrast than the stark monotone that was created. Yes, It does look clean, and modern. there is a place for it. I just do not think it belonged in that house. it looks nice.. i like white.. It is an interesting look and the contrast between the style of the house and the design is exciting. But for me, it just doesn’t work. I prefer design that is more authentic to the period and style of a house, and I don’t find modern/minimalist very livable. I do like the slate gray and white color theme on the outside of the house. Not really even “updated” Craftsman, but unique and pleasing. It sort of translates to “fresh”. But the inside, though creative and original, screams “look what we did”…a little like those Dream Street homes but for re-designers. I will give them points for continuity throughout this Contempocraft. But for actual living in it? Way too much “bungle” in this bungalow. I did cringe, to white for me but its wonderfully executed and I can appreciate the skill and work required for such a makeover. wtf……those floors……….all i can say is wow. not for me. WOW I love this house, everything looks perfect. Nice work. Do NOT like the floors. Can you say “1980’s pickled pine?” That look went out years ago, and with good reason. Also, not crazy about the master bath with all that dark taupey thing going on. It doesn’t seem to fit with the rest of the retro style house — which I love. They did a nice job with the house, but I’m a sucker for the original color of woodwork. I like the richness and mystique of the dark woodwork. I associate white woodwork with newly constructed houses. I really like this house and think they did a great job on the renos. Re the floors, we did the same style in an apartment years ago – white ash. They were beautiful as are these floors. I find all the comments quite interesting. What about just appreciating someone else’s style even if it’s not the same as yours and send a compliment for all their hard work and creativity. I live in a very contemporary house with lots of white, so I like white and clean and modern and I think there are some good things about this house. But, instead of really thinking about how to update and freshen this house while maintaining the vibe of a Craftsman, these people just said, “Oh, just paint it white!” I get a Liberace feeling from these pictures, rather than what they probably intended. It’s almost that these people were trying to hide this lovely house and make it something it isn’t. It’s not the house for them. I love this house–the white way. Ecept for those geen blocks on what may be a closet door. I want to just move in. I have sen craftsman style houses where the ugliness was preserved. I would leave them to the purists. I hope I can learn something from this example. I’m going to study every inch of it. Thanks for sharing it. A fun spin. Well done. I love it except for the white walls need texture!! To me its very simple and washed out. Texture would give it depth. Love the exterior color, would like to know what color it is. I don’t understand how someone can buy a beautiful Craftsman with all of that wonderful natural wood and destroy it by painting it all white. If that is what you want then buy a modern or indistinct home and go for it. People who love Craftsman buy them and spend months sometimes years undoing the destruction that people like this have done. I don’t live in a Craftsman, I live in a nondescript ranch home, but I appreciate the beauty of Craftsman homes and it kills me to see this happen. If you don’t like natural wood please don’t buy a Craftsman. I stumbled onto this site because I was looking for information to place in a letter I am sending to HGTV. They have a show called The Unsellables where the host thrives on painting over the natural wood in these homes. The reason there are so many styles of homes is so there is something for everyone. Don’t buy a grand example of a particular style, then destroy it’s distinct features while trying to make it something is wasn’t meant to be. If you want modern, buy modern. I hope that someday a person who appreciates a Craftsman for what it is buys this home and restores it back to what it was before these idiots ruined it. We restored a true craftsman bungalow some years ago — unfortunately it lacked the beautiful wainscotting in this house — and live in a glorified bungalow/farmhouse (late 20s) now. I agree with the poster who commented on the tone-on-tone. That is the beauty of old houses painted white. When you take into account the architectural interest and texture of simple but hefty trim work painted white against a white wall, it’s the light coming into the house — and these kinds of houses have lots of windows (major reason to live in one) — that creates the excitement. So, add me to the thumbs-up category on this house. Admittedly, I’m basically not a white wall person so after about 8 years with the white living room walls I painted them green. Most of my time in that room is at night so the color added intimacy and warmth. However, during daytime hours I do sometimes miss that play of the sunlight against the different white elements in the room. Also, thanks to the poster who noted that all wood is not created equal. Old pine used for trim in modest houses is still a lot prettier in its natural state than is new woodwork, but it’s not going to provide the same “gorgeous wood” vibe that you get from old oak. Floors are excepted from that comment though — old heart pine gives any kind of oak a run for the money. Every floor finisher who works in old houses that I’ve talked with feels the same way. My first instinct is “Love it!”, but as I keep scrolling down all the blandness starts to get to me, particularly in the hallway shot…I think if they had just kept the floors dark, that would have made all the difference. Love their style in general, and if it hadn’t been a lovely Craftsman home to begin with I probably wouldn’t think anything of it. The exterior is gorgeous, though! Wouldn’t change a thing about that! 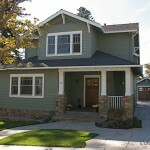 I know that there are two ways to go with Craftsman houses – all natural woodwork and all painted white. MY bungalow (much, much smaller than this one) has the natural woodwork (except in the kitchen, bath and upstairs bedroom). This is just too stark, though. And the mid century modern furniture just doesn’t ‘go with’ the architecture of the house at all. The owners should have bought a different house whose ‘bones’ fit their style better. Count me in the purist camp – I LIKE the moody, dark, cozy earth colors of traditional Craftsman style. The light colors feel cold to me. As someone from the midwest – I understand the limitations a traditional bungalow can pose – and that’s about the only architectural style available in the first-time homebuyer category. The wood is beautiful – but too much and it dominates the interior, if you try to introduce other styles of furniture, it can feel like an apartment – with your stuff “making do”. The exterior looks great but I cringe when I see in interior. Such a waste. Some people shouldn’t have money, in this case to buy paint. I was just watching “The Unsellables” on HGTV and was so absolutely appalled that in this episode they were painting all of the century-old woodwork white and covering up a beautiful brick fireplace with cheap plywood and marble that I hopped online to vent. Thanks for the forum. And Terri, your answer is spot on. Why? Why, buy a home with these priceless, irreplaceable features and ruin them. This “designer” needs to be stopped! I would not do the painting, but I like the way this house looks. What a shame! There is something so beautiful and classic about a true craftsman bungalow. What they have done to the inside of this house is sad. Buy some cheap new construction and do it up the way you want to, but a house like this should be appreciated for the fine work that went into it. Restore, don’t destroy. I live in a 1960 1.5 story “bungalow” (NOT a craftsman, but just your basic plain house, no woodwork). There are no craftsman bungalows in my immediate area, so I am working with an architect and builder to convert my home into a craftsman as best I can. If I can’t have the real thing, then I’ll make it as close as I can. If this were my home, it would look just like it did when it was built. We are re-painting our house. Is there anyway you can share what the exterior color used on this house is? thanks! I adore the craftsman exterior with the modern interior. It takes you back initially, but the owners have beautifully defined “their” style. We have a 60’s split level home that with a few changes, such as adding a porch with heavy columns and a gabled roof, we can transform into a craftsman style home. We our planning for a modern interior as well but we will be going with ebony hardwoods opposed to white, but hope to still get the same clean effect. I love this house. The idea that one needs to maintain the house in its original state is in itself outdated. Just because natural woodwork is authentic to the time period of the house, doesn’t make it aesthetically pleasing. Too much dark woodwork makes a room look dark. White woodwork is fresh, light, and airy. Also, I wouldn’t necessarily call this homeowner’s style contemporary. It leans more toward eclectic, which is think suits the style of the house. I don’t mind the painted woodwork. I don’t like the contemporary furniture or the shiny appliances. Why buy a classic traditional home just to do this to it? I know, 115 comments later, how original am I? .-= Emily@remodelingthislife´s last blog ..New Adventures With Feathered Friends =-. OK, so I’m seeing this entry a bit late. But — I love the white paint! While I agree that the “true” Craftsman style highlights beautiful wood, not all woods are created equal. Some are gorgeous some need paint. And I do think that the white-on-white scheme has a way of highlighting the style, as well. I’m not a fan of the floors, though. A dark stain would have brought in a bit of that old-world charm while contrasting with the fresh white paint. Since I’m into the Nantucket/Hamptons/shingle style of house, I really like contrast. I also don’t really like the curtains in the dining room; they seem quite out of character for the house (and not in a cool, eclectic sort of way). But overall, it’s a great house. OK, so I’m seeing this entry a bit late. But — I love the white paint! While I agree that the “true” Craftsman style highlights beautiful wood, not all woods are created equal. Some are gorgeous and some need paint. And I do think that the white-on-white scheme has a way of highlighting the style, as well. I’m not a fan of the floors, though. A dark stain would have brought in a bit of that old-world charm while contrasting with the fresh white paint. Since I’m into the Nantucket/Hamptons/shingle style of house, I really like contrast. I also don’t really like the curtains in the dining room; they seem quite out of character for the house (and not in a cool, eclectic sort of way). But overall, it’s a great house. This house makes me sad. Can’t believe someone would ruin a craftmans home with white paint on all the beautiful wood work. It’s a shame. You know what they say, “Money can’t buy good taste.” Hopefully someone will buy the house in a few years and restore it to its natural beauty. If the owners wanted a contemporary home, they should have purchased one and left this home to a true lover of the craftmans style home. I live in a 1920’s Craftsman bungalow and what sold us on it was the natural woodwork. Sadly, most of the homes in my area suffer from cans of white paint so whenever someone new walks into our home, they comment on the beauty of our natural wood. I totally agree with those previous to me that said if you want a contemporary home, buy a contemporary home. Although I think the white has its own beauty, the charm of these Craftsman bungalows comes in the warmth of natural wood mouldings and built-ins. Incidentally, if anyone in Salt Lake City is looking for a 1920’s bungalow, mine will be on the market next week! .-= Kathleen´s last blog ..Cute kids =-. If it wasn’t trying so hard to be mid-century modern I could like it except for the bleached floors. My MIL bleached her hardwood floors and they look very pretty but in a totally different style of house. I just looks remuddled here. I kinda feel sad for the house and the owners, both seeming to yearn for a style not to be. I love white trim and wood work, so that was A-OK by me. It’s the white walls with all the white trim that’s just not working for me. I’m not a fan of modern design, but I think it’s OK here. Just needs a little punch of color with paint in some of the rooms. A beachy sand or beachy blue would look great with the light hard wood floors. (not a fan, would’ve stainded them darker myself, but to each their own). I think this family yearns for a different style house and will eventually move. And the people who buy it from them will strip the white paint on the trim and stain the hard wood floors a darker color. The only thing to leave “as is” is the beautiful kitchen. Love it! I like everything about the updates, except the floor. Pale wood looks cheap, like laminate (is that what the fake wood that snaps into place is called?). I believe Nate Burkus, the interior designer, said he likes to use dark wood floors in his designs. The deeper colors add so much more warmth and texture to any room. They wouldn’t have taken away from the rest of the house being so white. Well I’m user I am biased by the countless hours my wife and I have spent scraping 50 years of paint off of some beautiful wood in our fixer-upper. That stated I think they have done some good work. The bathroom and kitchen look great. No reason to live your whole life in 1935, but what a shame to paint over the beautiful woodwork in the living area. Kind of like putting sheepskin seat covers over the beautiful leather interior of your Jaguar, only Sewing them down! Wood doesn’t have to be dark. We included well placed skylights, mirrors, and large glass doors to let in as much light as possible. The light and wood work very well against each other giving a more organic feel. OMG I absolutely LOVED this house. It is adorable, impeccable, bold and creative. To each his own. Kudos to the owners. Purist Craftsman woodwork is lovely in theory, but can be dark, oppressive and overly dominant. It can lock you into creating a period interior where nothing works unless it was made by Stickley or Roycroft. Personally, I don’t care to live in a museum. Therefore, I think there is often a good argument for painting woodwork white or ivory, especially if it’s not “special,” such as very fine quarter-sawn or figured wood. However, in this house the matching walls white walls and very light floors detract from the graphic impact that the trim could, and in my opinion, should, make. Contrast and texture create richness. This place is one-dimensional – all-white and all-shiny. Not only does it appear that the owners secretly want a mid-century ranch, but they want it to be located in Miami Beach. As soon as I saw that hallway, a can of Aqua-Net and a martini popped into my head. What bothers me the most about this is that no matter how “tastefully” designed this home may be, not only has it destroyed the charm and appeal of what used to be a craftsman home, but it’s only fueling the misconceived belief that modern can only be cold. If the person doing this really knew what they were doing, there would be more punches of color strategically placed throughout the home, as well as strayed away from this overly washed out color palette. WAY too white. I don’t mind the kitchen but the white woodwork is a sin. Craftsman homes are gems that shouldn’t be made over to try to be something they aren’t. Too white. One of my favorite things about bungalows is all the beautiful wooden molding. No way I would paint it all white. Nothing like blending all the details together to make a house look bland! It’s obviously a positive nod towards respecting the craftsman heritage of the home, but it’s as if the house is in the middle of an enchanted dream of what wonderous possibilities the future may hold. I LOVE the daring, fantastical imagination here. It looks fresh and amazing! That being said, I could never bring myself to paint natural woodwork. With all the outrage at ‘having painted over the woodwork’ aren’t we assuming that the woodwork was unpainted upon their arrival? Most Craftsman era homes were workers homes that were mass produced, they are simple and generally not recognized (particularly in those communities or neighborhoods where they were mass produced) as high art or particularly historic. As a result, many (if not most) had their woodwork painted over YEARS AGO. If that is the case here, it seems that the designer made the best of a situation rather than the laborious task (already mentioned here) of stripping everything. There is no question that this Arts and Crafts bungalow, like many, would have wonderful warmth as a home with it’s wood unpainted. At the same time, I have a really difficult time condemning those that redecorated to the outer rings of hell. While me and my dogs, or any number of other scenarios might not work in such a clean, white, sterile, etc. palatte, it’s truly lovely and balanced and despite it’s coolness – it is very inviting AND it is enough to help people consider looking into the question of Craftsman and educating themselves a bit so that, perhaps, if they ever have a Craftsman bungalow they can intelligently make decisions about woodwork, etc. The exterior is nice, but not a fan of contemporary interior design. I want a wrap around porch and beautiful and homey inside!! oh me oh my, I love this house. I would have left the dark hardwoord floors, but everything else! I love. love everything except the floors. the white trim makes it look light and not so stuffy. i love the outside color choices. The pickled floors are wrong…just wrong. The wallpaper or whatever it is in the hallway is terrible. I could go on but will stop and just say…to each his own. Beautifully decorated. i love the yellow wallpaper on the hall walls. I love the outside sooo much! So charming. I love the master bed and bath. But the hallways just well creeps me out. The formal dining room reminds me too much of Beetlejuice-and the floors are too white. If they made it a beautiful chestnut it would really make the room pop for me. But Id be too afraid to go in their house for a visit! But overall its a very cute and modern home. I think the contemporary look could have been obtained without going so monochromatic in some of the rooms. Even contemporary homes have nice, warm, wood accents. I do like the basic look of the home though, expecially the exterior. I love Craftsman style. It’s my favorite. I want a wrap around porch and beautiful and homey inside!! Stupid people should not be allowed to move into old homes . They always do something idiotic like paint woodwork or try to make a house what it is not.